"We were losing money every time someone added guacamole to their burrito." The People's Pint, a brew pub in the Western Massachusetts town of Greenfield (population just over 17,000), has an avocado problem. The restaurant took the popular item off its menu four months ago. No more guacamole with tortilla chips, no avocado slices on a sandwich. "The price for a case would fluctuate from $35 to $80," said General Manager Josh Breitner. "Even if they're perfect, you throw half the weight away [because of the pit]." Avocado prices are a problem for many restaurants, with several places already charging an additional amount to add the fruit — yes, it's not a vegetable — to dishes or as a side. Last year, case prices started at about $30 and hit $90 by late summer, according to Leo Kremer, co-owner of the Dos Toros chain, with 14 locations in New York and another three in Chicago. "When it was $90 a crate, we estimated that we were losing money every time someone added guacamole to their burrito," Kremer told NBC News. That was at $1.25 a shot. "Avocado is a huge percentage, roughly 10 percent of sales volume, but it's a higher percentage of cost for us because we try to subsidize guacamole for our guests." "We're at around $40 a case right now," Kremer said. "We're a little higher now than we were last year." This could be an expensive year for two reasons: weather and an upward spike in demand. 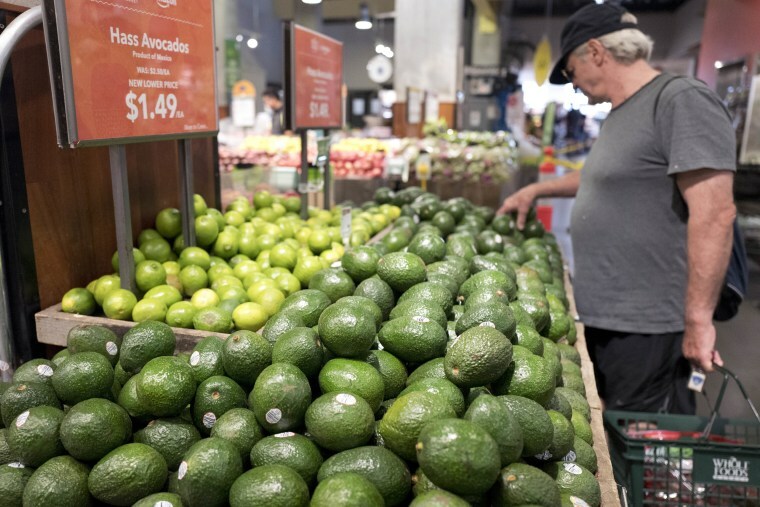 "They had bad weather in the two main avocado growing areas, in California and Mexico," said John Stanton, a professor of food marketing at Saint Joseph's University in Philadelphia. According to calculations based on figures from the Hass Avocado Board (named for the dominant varietal), 2018 production on the average has been short of estimates by 4.6 percent. "At the same time, demand is up," Stanton said. Look at the avocado toast craze and big chains adding preparations to their menus. In March 2017, even Starbucks added guacamole to pre-made sandwiches. Not every restaurant gets hit to the same degree. Bigger operators get contracts that can help protect them from price spikes. "They perhaps saw a spike to $50 or $60," rather than $90 a case, said Ric Scicchitano, managing partner at consulting firm Food & Drink Resources. But for many restaurants, walking away from avocados can be difficult. "Guacamole is an integral part of the food we sell and who we are," Kremer said. "It's not like we're a sandwich or salad shop that can elect to not have avocados. And we're committed to holding down prices." Even if it means being out of pocket. Demand doesn't look as though it will let up. "Guacamole is almost nature's version of butter," Kremer said. "I think it's only going to become more and more popular." Chef Andrew Gruel of three different restaurant concepts in California — Slapfish Restaurants, Two Birds Chicken, and Butterleaf — agrees. "If you take it off the menu, you lose sales," he told NBC News. Gruel blames that millennial favorite, avocado toast, and the craze it has seen through Instagram shots of the product. "The worst dish ever created. And restaurants charge $12 for avocado toast," he said. Other than raising prices or dropping avocados from the menu, there are a few other options for restaurants. "[When prices spiked last year,] the first thing everyone started doing was switch over to this avocado pulp or puree," said Gruel, who described it as "avocado colored puree that tastes like lemon juice and baby food." Gruel's restaurants "researched and tested hundreds" of fresh avocado substitutes until they found fast-frozen slices that are now part of their guacamole. "You still have to use some fresh avocado to fortify it, though," he said. "There are [additional] ways for restaurant operators to trade up and down on the grading scale and size of avocados," said Scicchitano. "They can go to a smaller-size avocado that usually isn't used in retail. You can buy avocados that have blemishes and scaring on the outside of the avocado." Scicchitano's firm tries to discourage their clients from buying the pulp. "Real avocado eaters … can tell when a restaurant is doing a bait and switch," he said. In the meantime, expect that prices could continue to climb — and don't be surprised if a local small restaurant is a little less generous with the guacamole than usual.